I’m sure I’ve mentioned before that I am a big fan of Jenny Doan and the Missouri Star Quilt Company. Jenny was definitely the final inspiration for me beginning my quilting journey. Last year when Jenny did the YouTube tutorial for the Fall Shenanigans wall hanging, I knew I had to have one for myself. In the original tutorial Jenny used Halloween fabrics – I decided to use batiks in traditional Halloween colors. My wall hanging measure 42 x 42 inches. The quilt is hanging in our entry way and I absolutely love it! Linking with Linky Tuesday at Freemotion By The River. I participated in my first QAL this past quarter. It was a mystery quilt along hosted by Cindy at In a Stitch Quilting and Tracy with It’s a T-Sweets Day. I loved their QAL concept of using a focus fabric to create any project of your choosing. The focus fabric for this past quarter was “Tea Flowers” from the English Tea collections by Connecting Threads. It is a vintage small floral print but the tomato red color made me think of Christmas. Camille Roskelley’s Swoon block has been on my to do list for quite awhile. 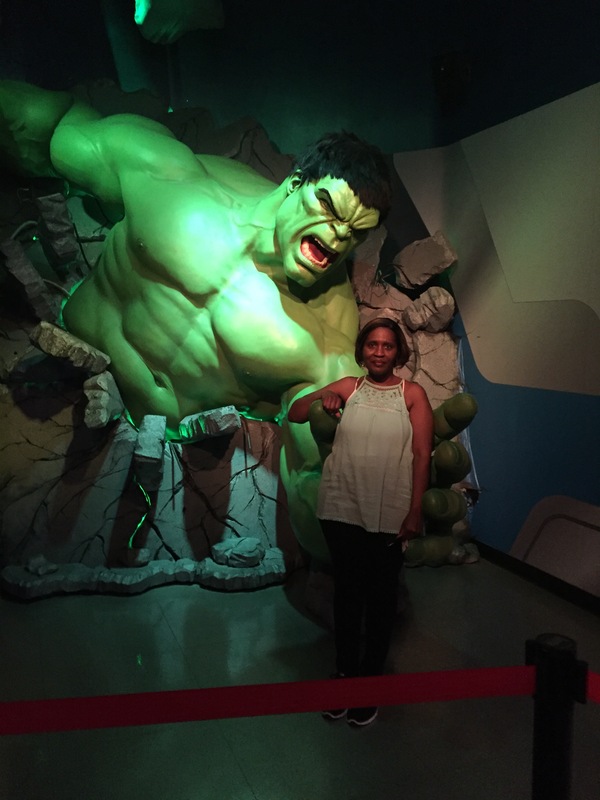 This QAL was the perfect opportunity to make it happen! My swoon table topper/wall hanging measure 30 x 30 inches. Although the front doesn’t scream Christmas – my backing certainly does! Thanks for stopping by – Happy Sewing! I finished piecing a small wall hanging using the Jacob’s Ladder quilt block. Jacob’s ladder quilt block is beginner friendly. Below is the layout for the quilt block. Easy to assemble with 5 four patches and 4 half square triangles. The pattern for making the quilt block is a free download you can find here. 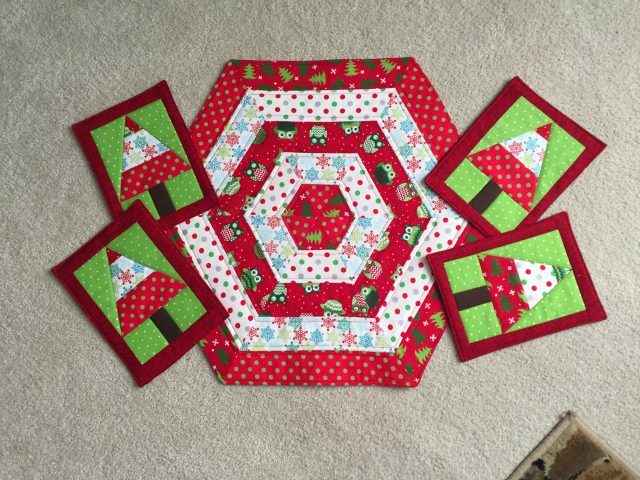 The Fat Quarter Shop is also offering a quilt pattern to make different sizes. If you are interested you can purchase it here. If you’re like me and like visual instruction you can watch Kimberly Jolly’s YouTube video creating the Jacob’s Ladder quilt block. I added a small inner border using the background fabric to frame the four quilt blocks with an border using the floral fabric. The floral print has both the teal and plum used in the quilt blocks and ties it all together nicely! I’m happy with the results and looking forward to adding it to my finish column! The other classic block I made was the Bear Paw – another free download from the Fat Quarter Shop. The block unfinished was 14.5 x 14.5 inches. I wanted to try something different so I turned the quilt block into a quilted tote bag. It’s not pretty but very sturdy. I needed something to keep projects handy. We are traveling for a week and I’ll be able to get some binding stitched down. Good news — another finish!!! 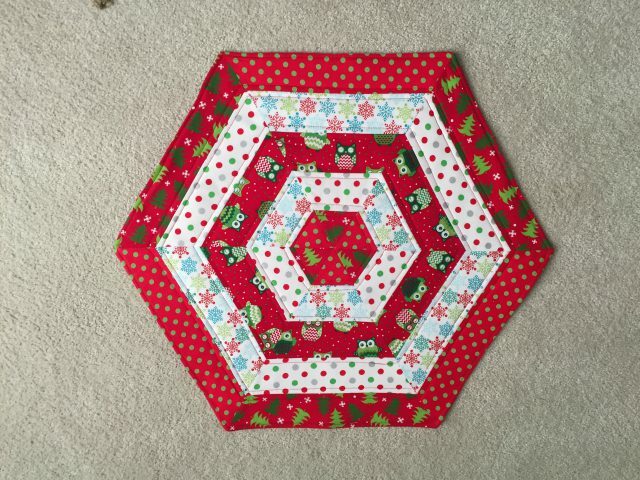 I finished my Christmas hexagon table topper that I started before Thanksgiving. 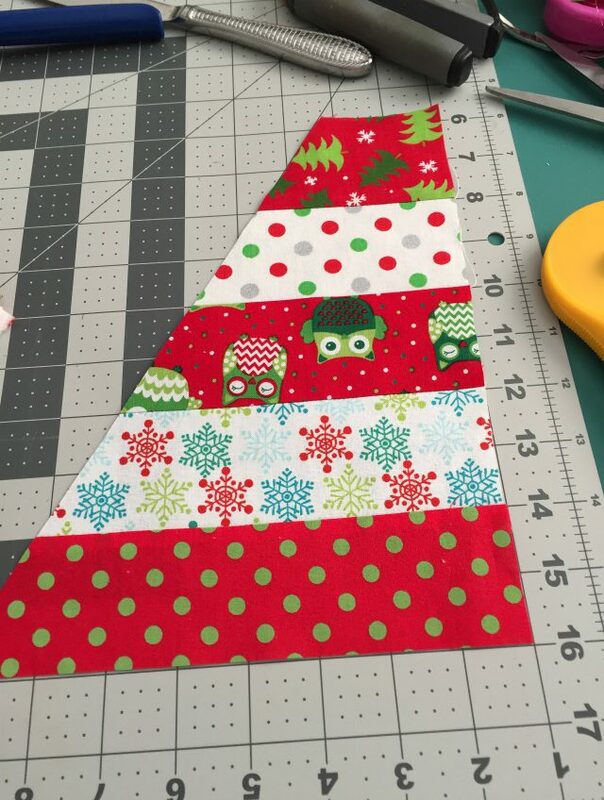 I used fat quarters for this topper and had large scraps left over. 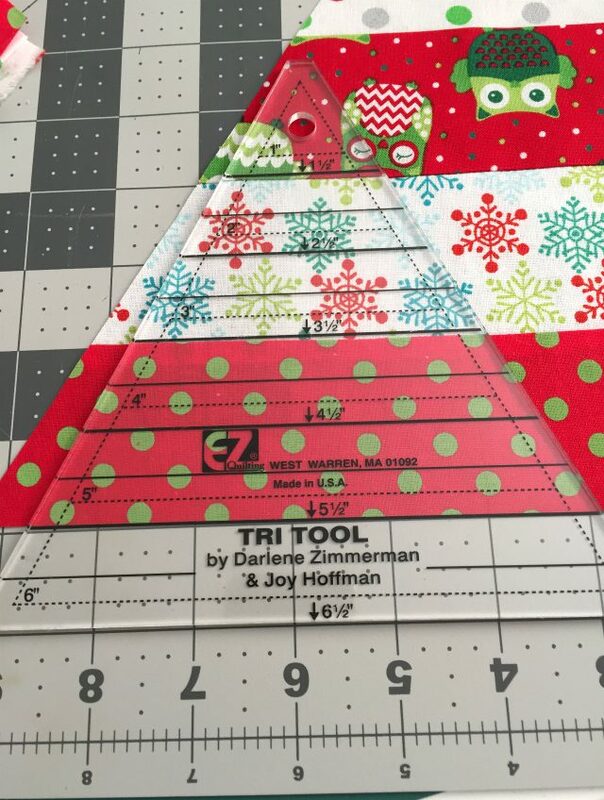 Because of their odd shape my first inclination was to toss them out – then I had the famous “aha” moment by realizing I could cut the scraps into smaller triangles using my tri-recs ruler set. 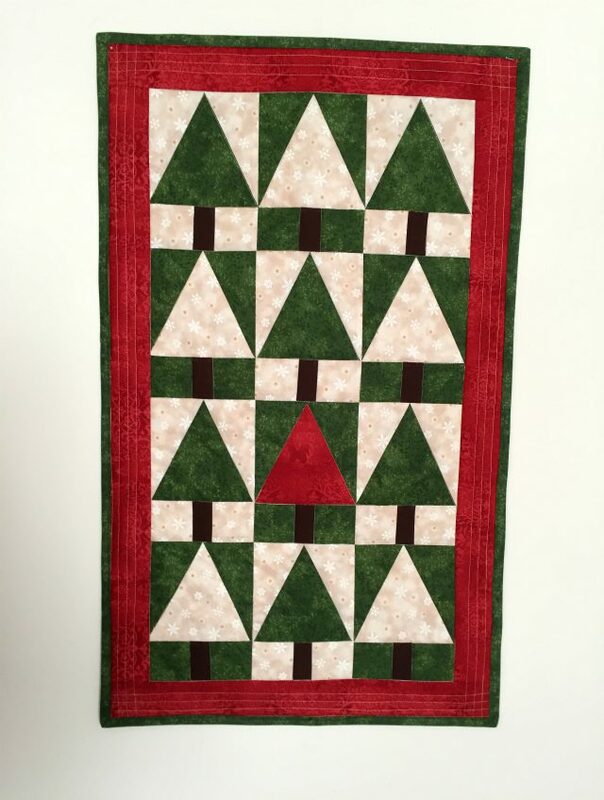 One of my favorite quilt pattern/tutorials is Christa Watson’s Modern Trees. Using the tutorial as inspiration I created 4 mug rugs from the scraps. One gift down many more to go! My husband’s family are big Green Bay Packer Fans. I made this wall hanging for my mother in law. Each panel was created with my embroidery machine including the quilting. I stitched the panels together added a backing, stitched in the ditch and added binding. 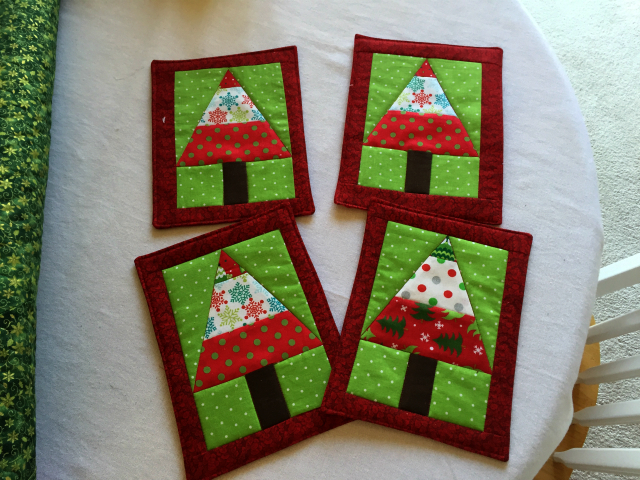 If you have an embroidery machine and would like to make one you can purchase the Fabric Strip Trees design from Chantell’s Creations. I used the 7.8 x 11.7 inch file to create my wall-hanging. I did manage to find time to make a small modern trees wall hanging for myself! Quilt measures 20 x 33. Fabric from my stash.